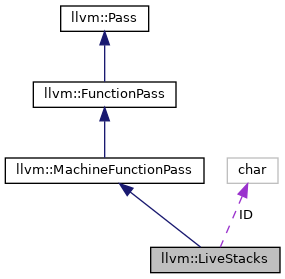 Definition at line 30 of file LiveStacks.h. Definition at line 52 of file LiveStacks.h. Definition at line 51 of file LiveStacks.h. Definition at line 47 of file LiveStacks.h. Definition at line 54 of file LiveStacks.h. Definition at line 56 of file LiveStacks.h. Definition at line 55 of file LiveStacks.h. Definition at line 57 of file LiveStacks.h. Definition at line 35 of file LiveStacks.cpp. Definition at line 63 of file LiveStacks.h. Referenced by matchPair(), and false::IntervalSorter::operator()(). 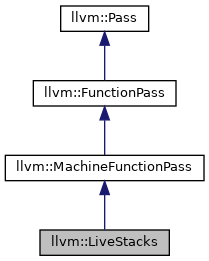 Definition at line 70 of file LiveStacks.h. Definition at line 79 of file LiveStacks.h. Definition at line 59 of file LiveStacks.h. Definition at line 57 of file LiveStacks.cpp. References assert(), F(), llvm::TargetRegisterInfo::getCommonSubClass(), I, and llvm::TargetRegisterInfo::index2StackSlot(). Definition at line 88 of file LiveStacks.h. References getAnalysisUsage(), llvm::RISCVFenceField::O, print(), releaseMemory(), and runOnMachineFunction(). Definition at line 77 of file LiveStacks.h. Definition at line 75 of file LiveStacks.cpp. References begin(), E, end(), getIntervalRegClass(), llvm::TargetRegisterInfo::getRegClassName(), and I. Definition at line 42 of file LiveStacks.cpp. References llvm::BumpPtrAllocatorImpl< AllocatorT, SlabSize, SizeThreshold >::Reset(). Definition at line 49 of file LiveStacks.cpp. Definition at line 45 of file LiveStacks.h.